Mode: The BUMAT 2019 examination is in English and is conducted only on offline mode. 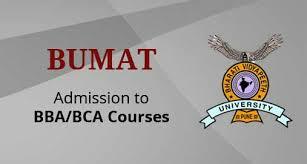 MCQ: The BUMAT 2019 will be a multiple choice examination with four options available for each question. Mark: Each correct answer will fetch you one mark. Negative Marking: There is no negative marking in BUMAT. Duration: The BUMAT exam duration is for 2 hours and 30 minutes. Questions: There are 200 multiple choice questions available on the test paper. Sections: There will be 4 sections available in the examination namely Numerical Aptitude, Reasoning and Logical Aptitude, Verbal Ability and Reading Comprehension.